Hope you all had a Merry Christmas! We did at our house. It was so busy though. We did lots of visiting, sleep-overs, eating and games. I think I need a few days of nuthin to do to catch my breath! I made this card for one of my daughters using the rubber image I illustrated for Whimsy Stamps called "Christmas Dreaming". Again, I happily used the Make It Crafty Blending Card, which, in my opinion (and many others) is THE BEST paper to use with Copics. Normally REDS are really hard to blend with each other and to remove with the blender pen. But not with this paper! 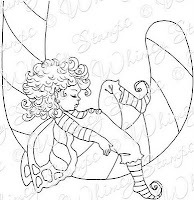 The reds on the candy cane and wings were easy to do, compared to my past experiences with other paper brands. See the shine on the candy cane? That was easy to achieve with the blender pen! This paper lets you push the colour deep into the fibres, leaving that shiny look. I am so impressed with it!!! I used the blender on the wings to remove some colour for vein lines and decorative dots. Afterwards, I coloured up close to the veins just to emphasize them and to make the lines of demarcation more prominent. It fit nicely into one of the circle dies from Spellbinders Grand Nestabilities. I used some Distress inks to sponge around the edges. Thanks for looking today and come back again soon! I have another card to show you today in which I used Zoe's "Make It Crafty Blending Card". I can't say enough great things about this paper. It is a total DREAM to work with! I recommend it for Copic beginners and experts alike. I get zero compensation for saying that, I am not affiliated with Zoe's store (we are just good friends!). But I am just in "paper love" with this stuff!! ha ha! Before I go on with my card deets, I want to be a proud Mom and ask you to vote for my daughter Ashley! She is in a contest in which the winner gets a recording contract! You can go take a listen to her song HERE and vote for her!! It is for the MMG's top new song of 2011! She is in the TOP THREE!! Woot woot!! Please give her your support!! She has an album out and I have a link on the right side bar if you want to listen to snippets of the whole thing. You can order a hard copy or buy it from iTunes! 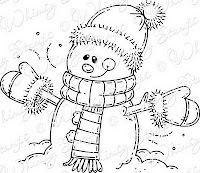 Sundays With Crissy (my challenge blog! ): Anything Goes! You don't want to miss this! Whimsy has their new magazine out and it is FREE!!! It is a beautifully laid out magazine with gorgeous creations from the DT AND Whimsy customers! Plus my great friend is a featured artist and she has a great article to read. You will love this! Go check it out! Hi Peeps! 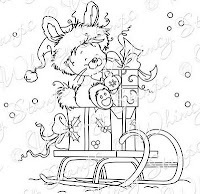 Christmas is almost here and I am so excited! 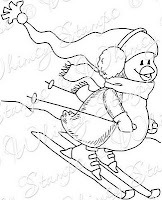 Here is a card I made using my Snowman and Penguins digi stamp image. I am happy with how this one turned out! This was my first time using Zoe's paper from her store, "Make It Crafty". The paper is one she discovered for Copic users and it is called, "Make It Crafty Blending Card". I want to say ahead of my next statement, that I get zero compensation for plugging her product. Now Copic lovers, hear me.... THIS PAPER IS THE BEST I HAVE EVER TRIED FOR BLENDING COPIC COLOURS!!!!! 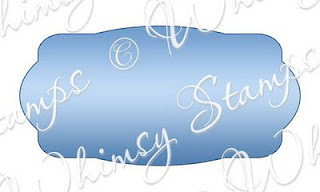 It is a dream to work with -- I have NEVER seen the Blender pen work like this before -- oh the joy of seeing the effects with this paper -- if you have never tried it before, please go to her store and get some NOW!!! You will not be sorry!! It is now my new staple to go with Copics. I can't believe Zoe found this paper-- I always knew she was a sweet heart AND super smart AND super creative. Well it seems she has reached genius level with the discovery of this paper!!! Oh I can't say enough about it. 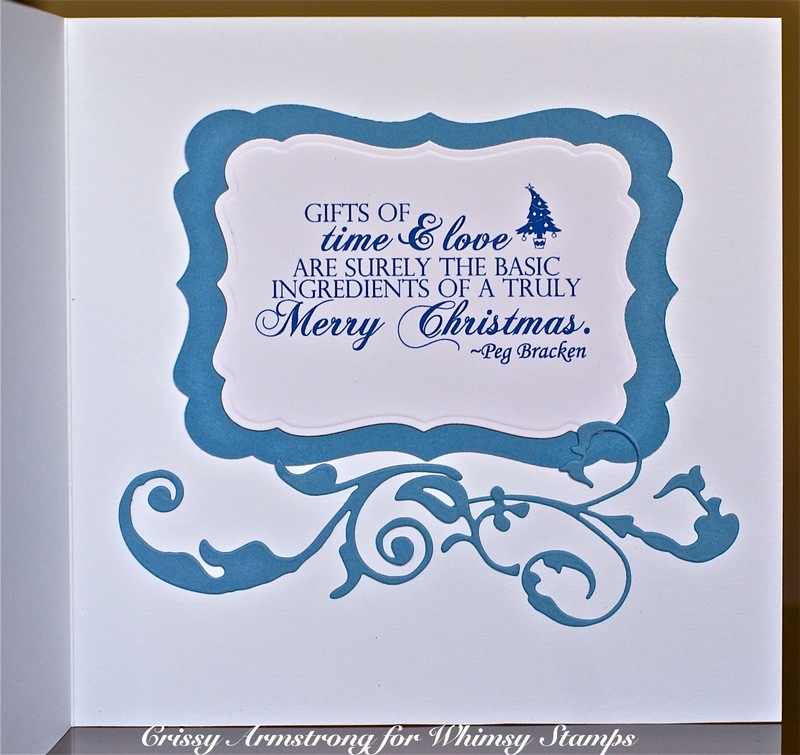 The die cuts are Ann's own Elegant Flourishes and I love using them! I painted the edges with a gold automotive paint loaned from hubby. It actually works a lot better than the gold crafting paint I was using! Now you see the sky and the snow and how I kind of melded the two into each other in a unique way, with no line of demarcation? 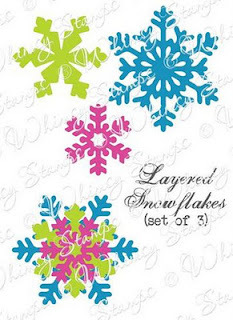 That's the beauty of this paper from Make It Crafty. I could not have done that with any other paper I use! What a joy to work with this stuff!! 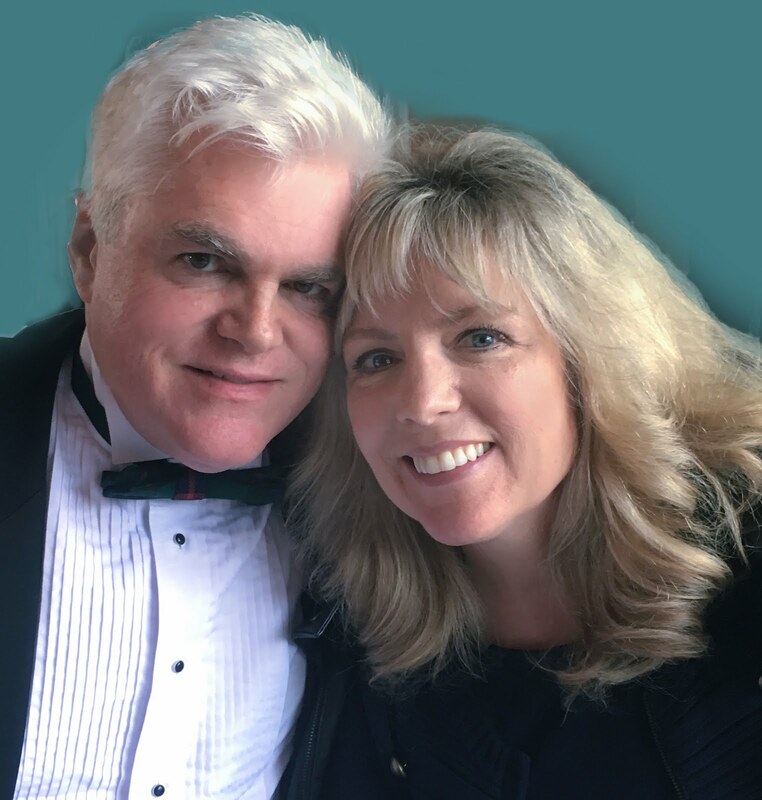 My own challenge at Sundays With Crissy: Anything Goes! Pile It On: Bling It Up! Also be sure to check out the new release at Whimsy! I have some new images there as well as all the Whimsy Artists! Hello people, welcome to my blog today! 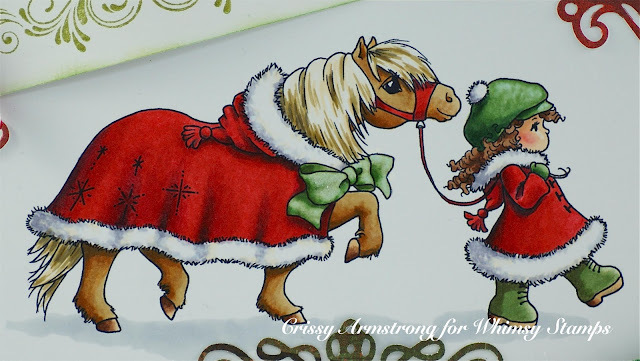 I made this card with my monthly challenge in mind, over at Sundays With Crissy. I wanted to make this an easy peasy challenge because I realize this time of the year can be a very busy time. So if you do join in, feel free to create as your heart tells you, and enjoy the process! It's Anything Goes! 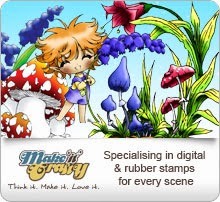 On my card, I used "Little Artist", a digital image I did for Whimsy Stamps which was released last month. I printed her on a light brown/grey pastel paper and coloured her with pencil crayons. I made and printed the sentiment from my computer. The die I used is a new Shapeology Die from Whimsy called Elegant Notables 1. I just love it and will be using it often! 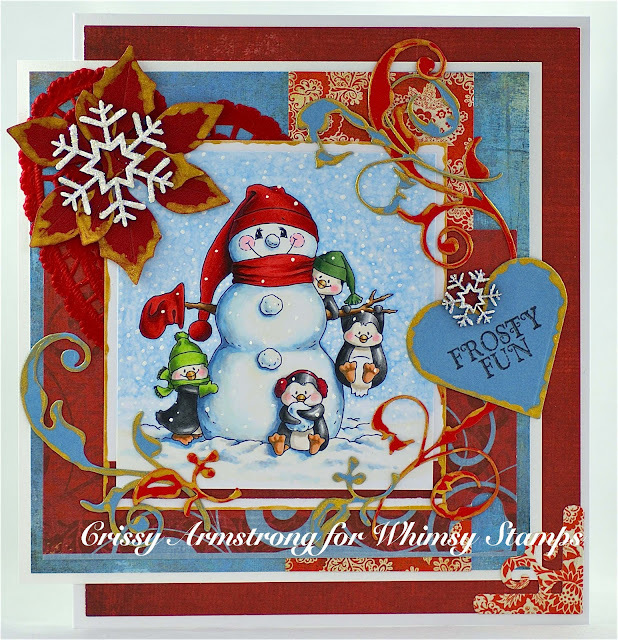 The swirly leafy die cuts are also from the Shapeology collection at Whimsy and are called Vines Die Set. They are destined to see a lot of use too! 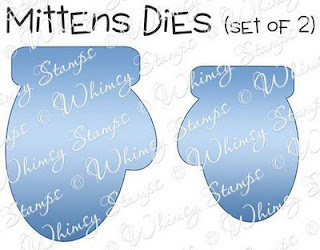 I just love the die sets that Ann comes up with for Whimsy. 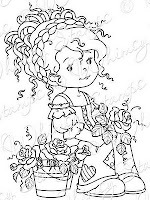 The flowers are also from Whimsy, from their Whimsy Buds collection. They were white but I used my Copics to add a touch of pink to them. Pink and neutral DP layers are from Basic Grey. Thank you so much for stopping by today! 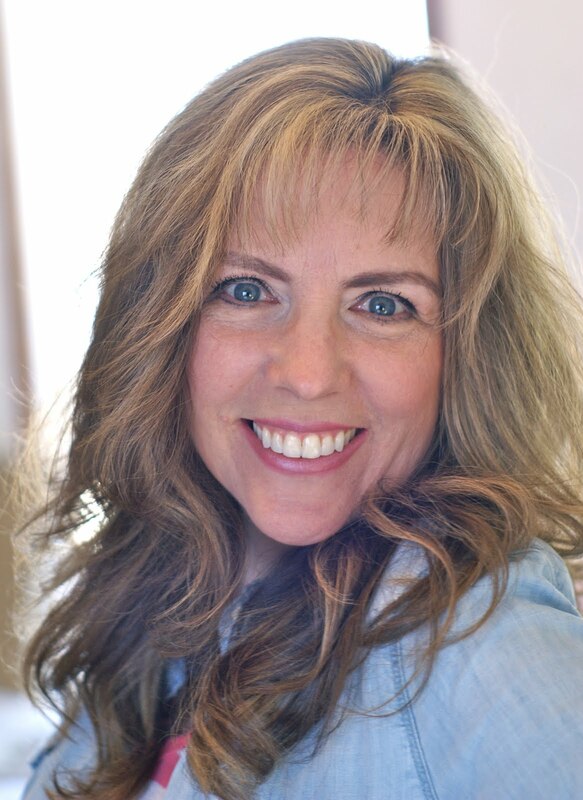 I hope you will join us over at the challenge blog Sundays With Crissy. Be sure to check out what my DT has been up to all through the month of December. They always come up with inspiring creations! And of course there is a mini bog hop on to showcase all the new digital images. 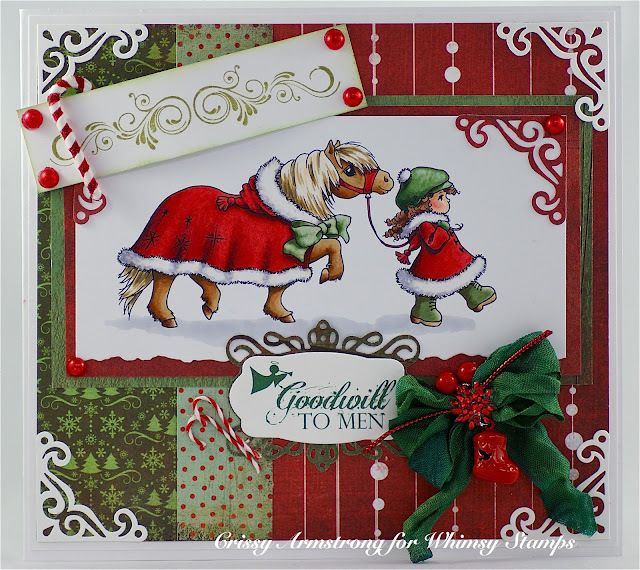 Go to the Whimsy Inspirations Blog for all the details and the links to the nine DT members who are showing off the newly released images in some pretty awesome creations! Be blessed and know that you are loved! 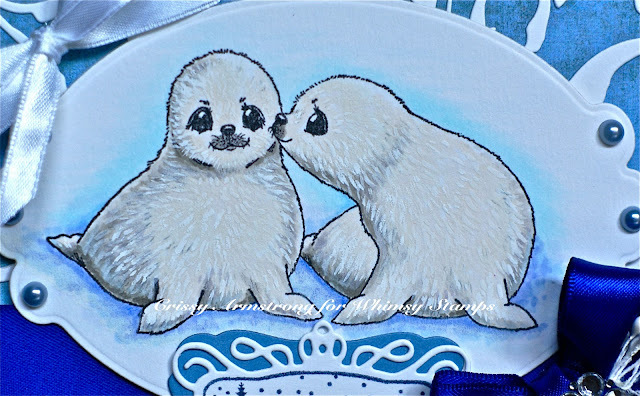 Since I draw for Whimsy, I thought I would put this info out there from their Whimsy Inspirations Blog. I just copied and pasted it for your convenience. Please do not approach me about getting on the DT. I don't have anything to do with that, other than to announce this call to you. Thanks precious peeps!! 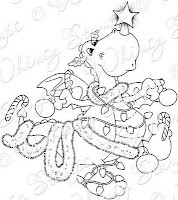 Whimsy Stamps is also holding a Design Team call from now until December 9th. We are looking for some talented crafters to join our Digital Stamp DT and help us showcase our growing digital stamp collections. 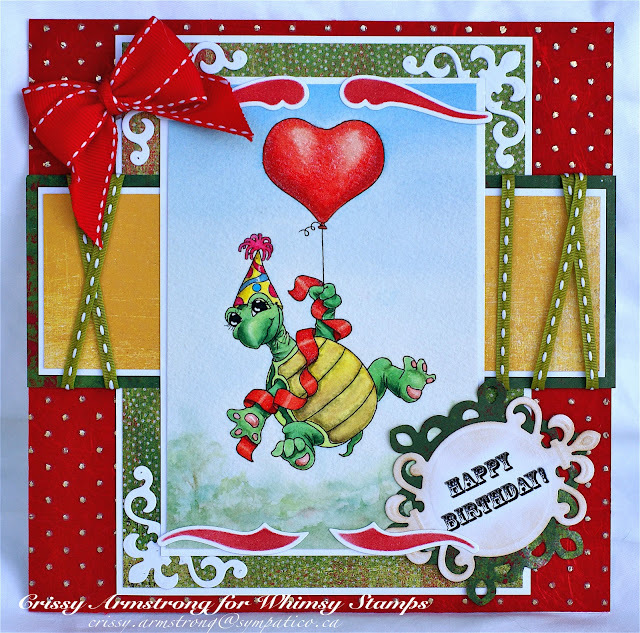 * Participate in at least 2 monthly challenges on our new Whimsy Inspires Challenge blog. The challenges post weekly, but DT members are only required to participate bi-weekly unless you choose to do more. 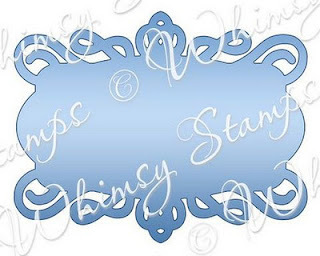 * personal bio and photo will be placed on our blog.If you are interested in applying, please send an email with your contact info, blog link, some details about yourself, and 3 of your favourite projects to whimsystamps@gmail.com with the subject line Digi DT. We will reply to let you know your application has been received. 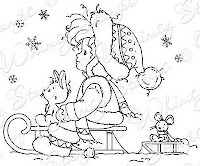 All new members will be contacted during the week of December 12th and announced on our Whimsy Blog thereafter. New Rubber at Whimsy! Plus new Dies! Hello People! 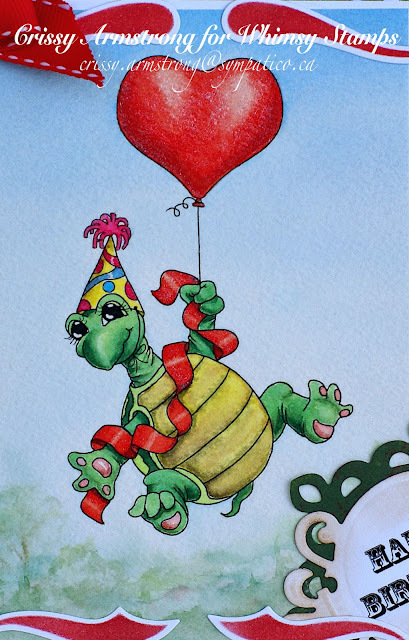 Today is Release Day at Whimsy for all the new rubber and metal dies by all the Whimsy artists! Scroll down for all the fun details. All the new products are pictured below for your convenience. And be sure to read the fine print -- there is some blog candy up for grabs, so you might want to get in on that! I am showcasing one of my rubber images today, "Sealed With A Kiss". Also, this card is for my challenge blog over at Sundays With Crissy. The theme is "Christmas card using non traditional colours. 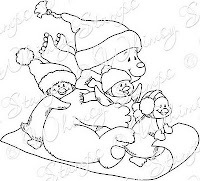 Thus, the absence of red or green on this Christmas card! Why not pop on over there for the details on entering the challenge too! 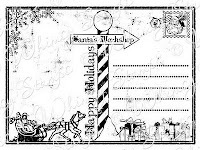 I stamped the image with Memento Tuxedo Black ink onto Manga Drawing Pad by Canson. 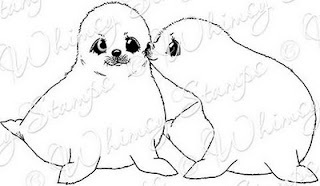 I first coloured all over both seal pups with E50 to give them a warm white hue. In the shadows I used W00, 1, 2, 3 4, 5, and a little bit of BB20 and B60 for some added cool notes. Overtop of my Copics, I used white pencil crayon and then I painted tufts of fur with Copic White and a small round water colour brush. Copic White acts like a very fast drying white acrylic paint. I love the effect it gives me when I use it to render white fur! B0000, 000, 21(just a tad), 60, 63, and 12. I also went over the shadows on the ground with a white pencil crayon. I used a 6x6 Basic Grey paper for the background (thanks Denise!!) from their Picadilly collection. 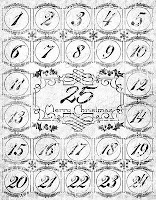 I covered it randomly with die cuts made using Ann's Elegant Flourishes Die Set. I will be using that set for many creations! It is just gorgeous! 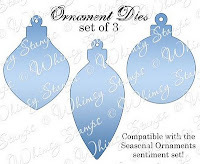 I am really loving Ann's new sentiment sets that have a matching die. Isn't that sentiment die to die for? Ha ha. It is so delicate and beautiful! 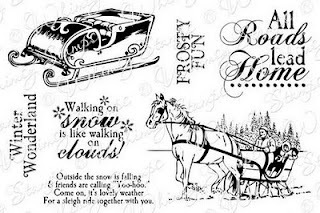 It's called Elegant Notables 1 and I paired it with one of the sentiments in her Winter Notables 1 rubber sentiment set. 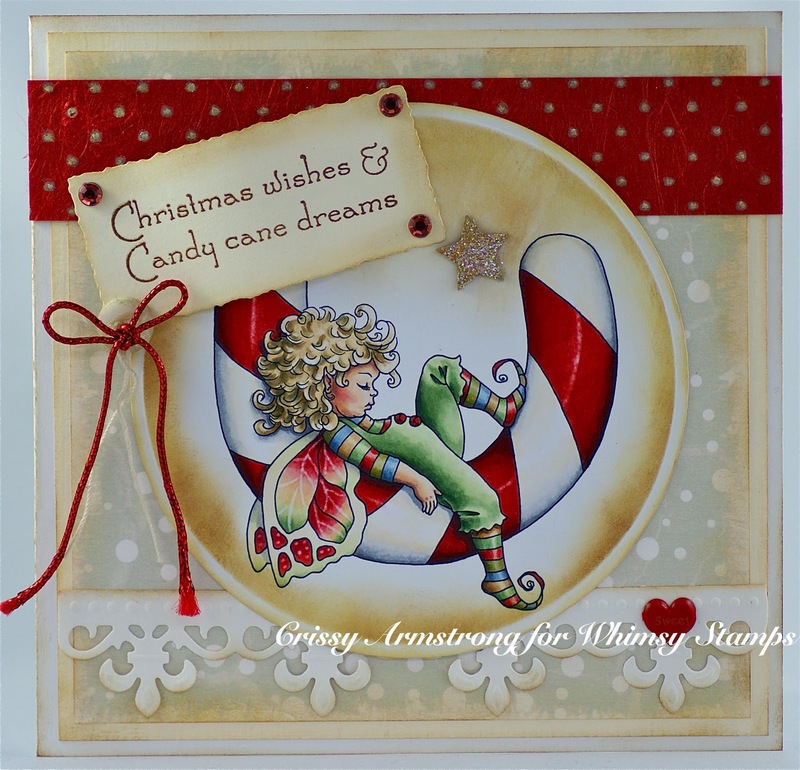 I used a digi sentiment by Ann on the inside from her Christmas Sentiments set, her Elegant Flourishes again, and a Spellbinders Die too. Welcome to Whimsy Stamps November rubber stamp and die RELEASE DAY! Don't forget to visit today's DT and leave a comment on their blog posts to be entered into the draw to win a new release stamp, then pop by the Whimsy Inspirations blog tomorrow for the next list of showcase posts! Thank you so much for coming by today people. May your day be blessed beyond measure! I have a very, very close friend who is also an artist. When we are together, a lot of people mistake us for sisters. 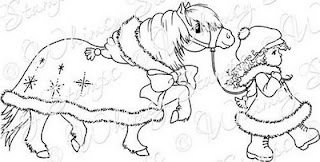 Which is a huge compliment, because she is gorgeous.. but anyway, she is now drawing illustrations for Whimsy too! Her line is Stampart Design by Kathryne. 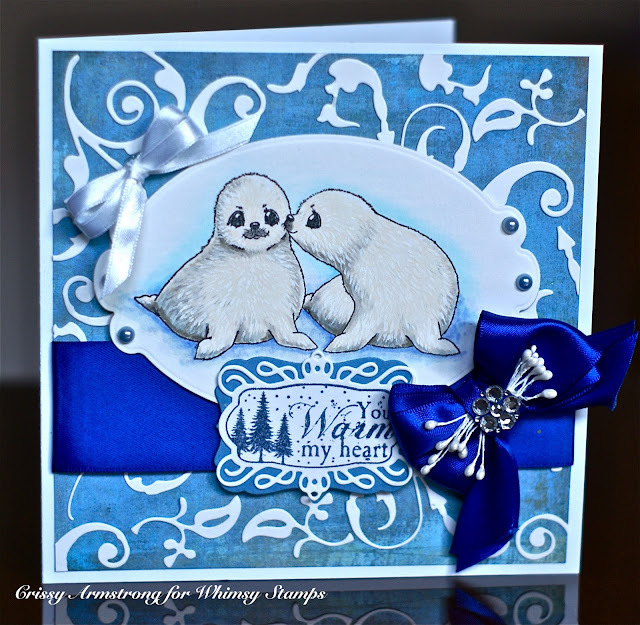 I just love these cuddling polar bears and wanted to showcase them on my card today. 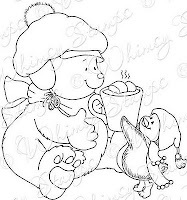 The image is "Polar Bear Cub - Melt My Heart" and can be found HERE. I coloured the image with Copics and it was easy to do on this darling image, and lots of fun. 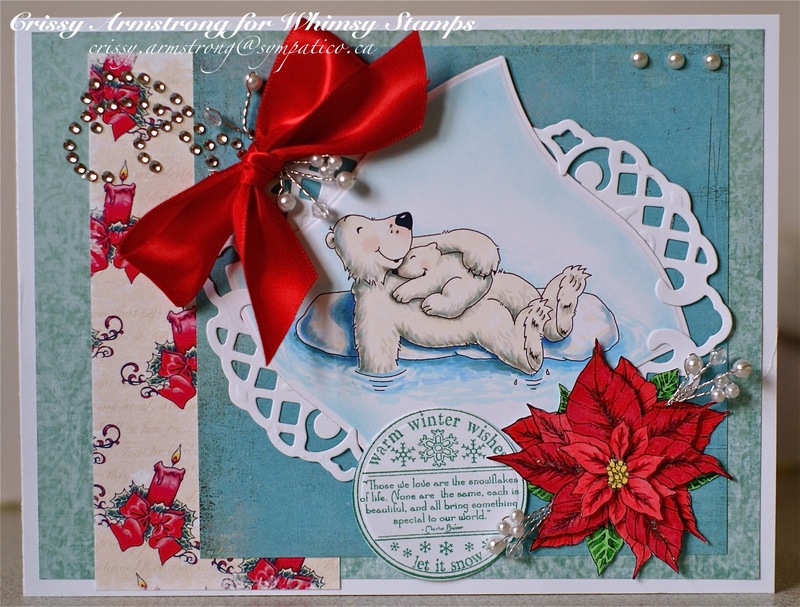 The sentiment, poinsettia image and candle DP are also all from Whimsy. I haven't had a lot of crafting time lately so I was really happy to get time to do this and help show off her line of digital images. 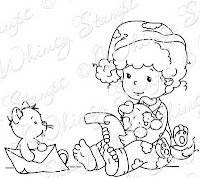 I hope you can go check out all her images -- she has a lot of really cute teddies and raggedies too. Whimsy has a new magazine published and its got some pretty breath-taking creations in it! I highly recommend you have a look! Just click HERE. Yes, it is FREE!! And. I don't know if I was sleeping or what, but lo and behold they published a mini magazine just before this one (how on earth did I miss it!!). So to view that one too, go HERE. Also, FREE! October Rubber & Die RELEASE DAY! Welcome to Whimsy Stamps October rubber stamp and die RELEASE DAY! 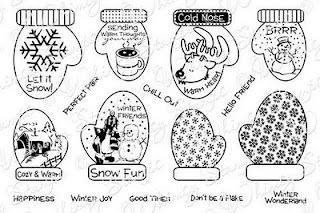 Whimsy Stamps has released 15 fabulous new rubber stamps and 2 wonderful new Shapeology die sets today. 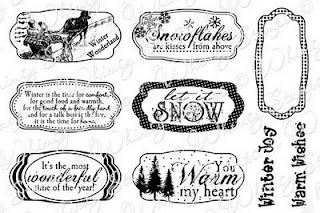 These new goodies are available to buy right now from the Whimsy Stamps store along with all your Whimsy favourites. 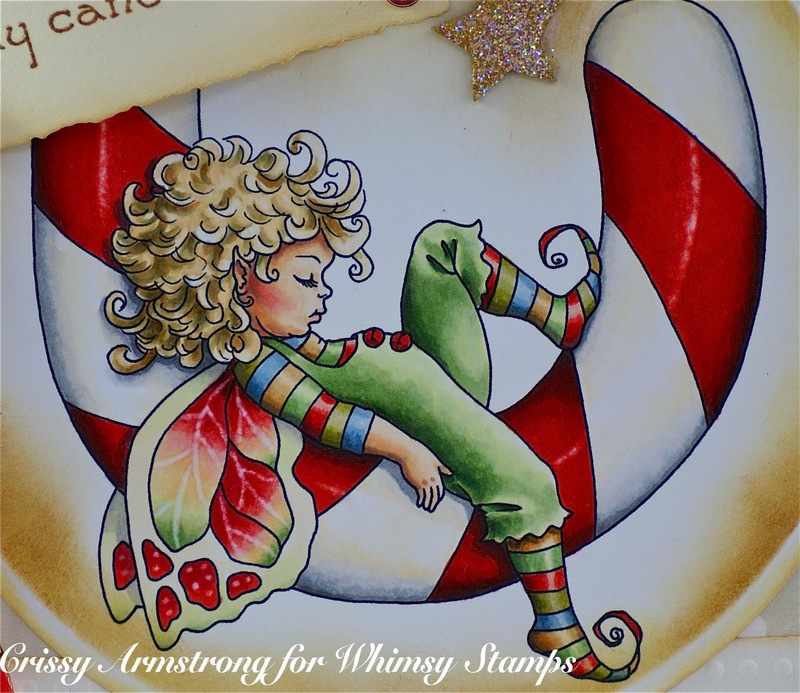 From today until 19 October, the Whimsy DT and Special Guests will be showcasing these fabulous new stamps and dies with a daily mini blog hop. Each mini blog hop has a new release prize hidden somewhere along the way and you will have 24hrs to enter each prize draw by ensuring you leave a comment on every blog listed for that day. To be entered into today's mini blog hop prize draw, be sure to leave a comment on ALL of the DT's posts listed below by 12.00PM EST tomorrow morning. 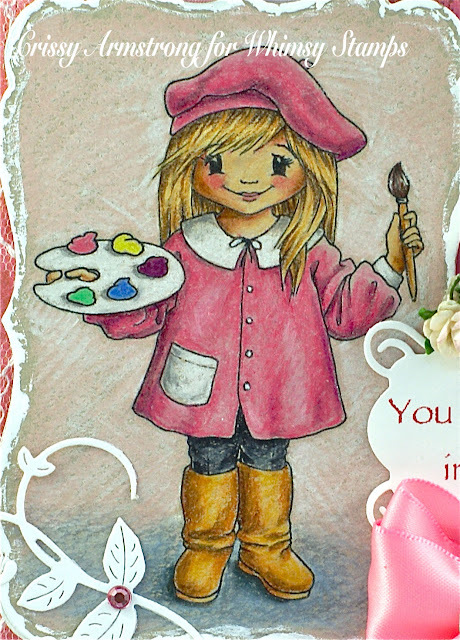 All winners will be announced here on the Whimsy Inspirations blog after 12.00PM on 19 October. Finally, we are pleased to announce that issue #4 of the Whimsy Stamps Inspirations Magazine will be released on 19 October! Woo-hoo! 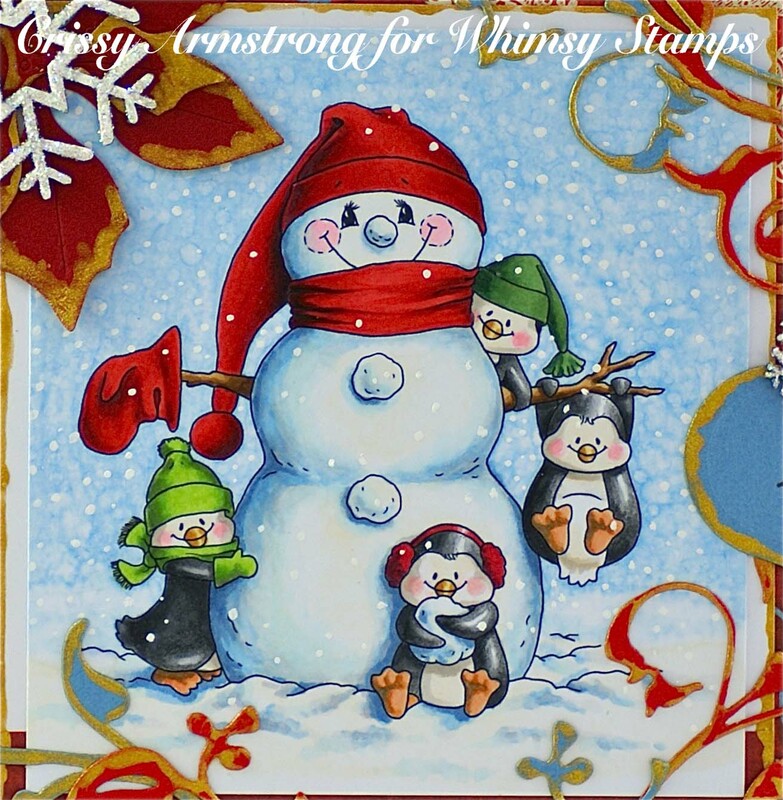 It's a full issue packed with never-before-seen creations from the Whimsy Stamps DT and guest designers, so be sure to check it out! 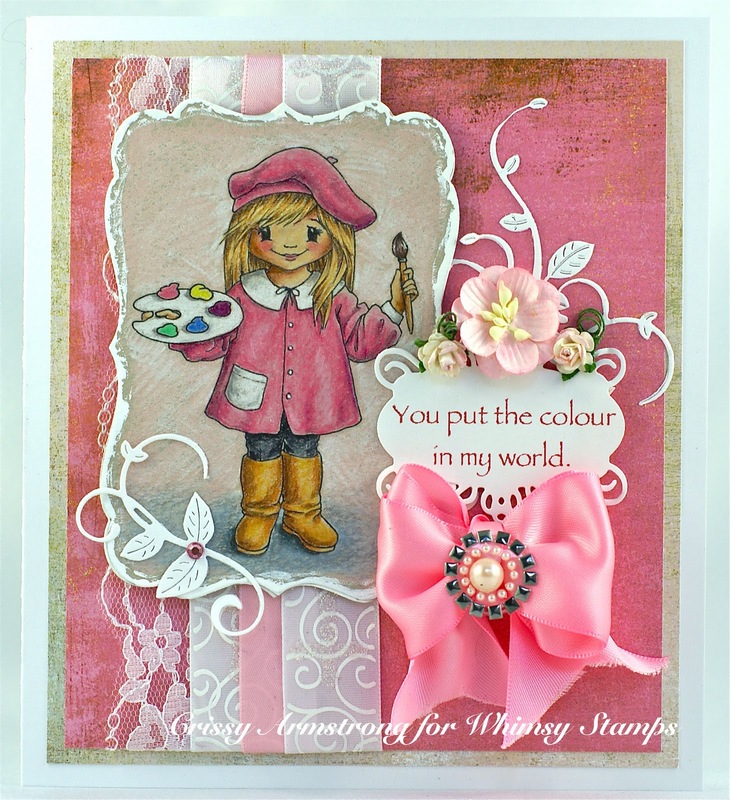 Don't forget to visit today's DT and leave a comment on their blog posts to be entered into the draw to win a new release stamp, then pop by tomorrow for the next list of showcase posts! Thanks for stopping by and I hope you enjoy our new release! I stamped "Come Fly With Me" onto 140 lb. cold press water colour paper by Canson. I water coloured the image using artist quality paints. I tried to give the background a feeling of distant trees and such and so that's why I left out a lot of details. I wanted to convey the feeling that this guy is floating way up in the atmosphere! 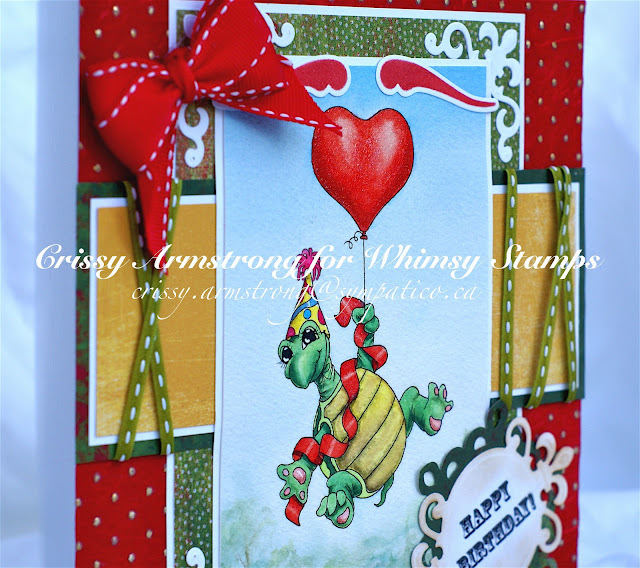 If you want any more card details, you can find them here in the August issue of the Whimsy Inspirations Magazine. Thanks for coming by to see what I've been up to! Hubby, daughter and I went out in the canoe at the lake that is five minutes from our house. These are some of my favourite shots from that venture. With the exception of this first photo and the very last (seagull) where I increased the colour intensity because it was slightly overexposed (very bright sun today), I did not increase colour vibrancy. These look just the way we saw it today. The lake was almost like a mirror and I found the shoreline really made for some interesting patterns. If you look at the photos sideways, you might see faces and even what appears to be skeletal features! Some faces look human and others look like animals! It is really bizarre! I love this seagull one too.